I’ve probably said every time I’ve done an Italian food blog that Italian food is my favorite because it is what I grew up on. I can be very picky on my Italian restaurants. However for a while I have heard nothing but good things about Verona Village Inn. So when I went I was expecting the best. Well the Verona Village Inn lived up to the hype! Let me start by saying the food quality was exceptional and the value was incredible. I ordered the Village Inn Sampler comes with 2 pieces of Chicken Parmigiana, 2 pieces of stuffed eggplant rotellini, a meatball and Fettuccini alfredo or side of pasta, I got the Fettuccini alfredo. BUT WAIT there is more… the dinners all come with soup, salad and toasted garlic bread. All of this for only $15.79. Most Italian restaurants would charge at least $25 for all of this. 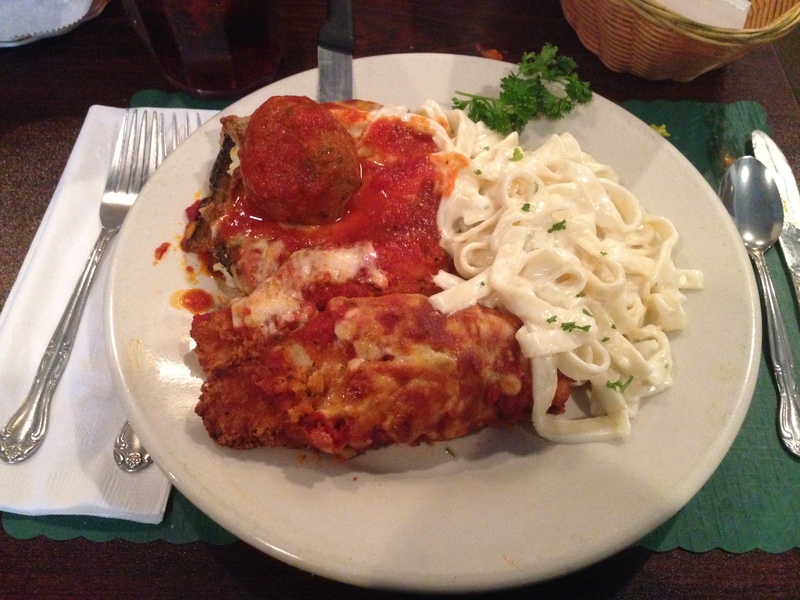 If you want good home style Italian food that brings the most bang for your buck, make sure you visit the Verona Village Inn. We also ordered a few appetizers, not that they were needed but we just wanted to try them. Breaded Zucchini – Fresh zucchini, thinly sliced, lightly breaded, fried to a golden brown. Served with village sauce. Also an order of Stuffed Hot Peppers – Banana peppers stuffed with a zesty blend of beef, sausage and spices baked in our village sauce with melted cheese. Between the two I really liked the Stuffed Hot Peppers, they weren’t overpowering but just had a nice kick to them. The menu at Verona Village Inn is pretty massive too, there is a lot that I want to try. It really isn’t an if I return but more of a when. The first thing on my list will be the lasagna, I saw a few people order it and it looked amazing.